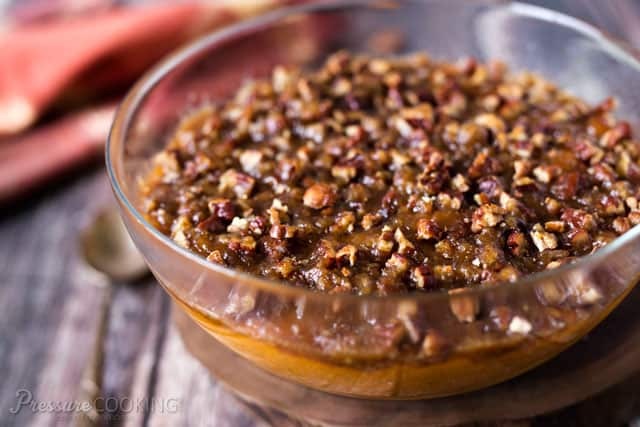 Creamy sweet potatoes dressed up for Thanksgiving with a sweet, crunchy brown sugar pecan topping. My husband likes a very traditional Thanksgiving dinner, so most of what goes on our Thanksgiving menu is non-negotiable. Turkey, stuffing and mashed potatoes and gravy are a must have. Growing up our Thanksgiving dinners always included marshmallow covered yams, but my husband and I never like them. A few years ago I was hosting Thanksgiving dinner and wanted to include sweet potatoes for my mom, but I also wanted to find a recipe that my husband and I would also like, So I tried Paula Deen’s Sweet Potato Bake. It was an instant hit with everyone and they’ve been on our Thanksgiving menu ever since. Instead of overly sweet, syrupy marshmallow yams, these sweet potatoes are mixed until they’re creamy smooth with heavy cream, butter, brown sugar, spices, and an egg to hold it all together. 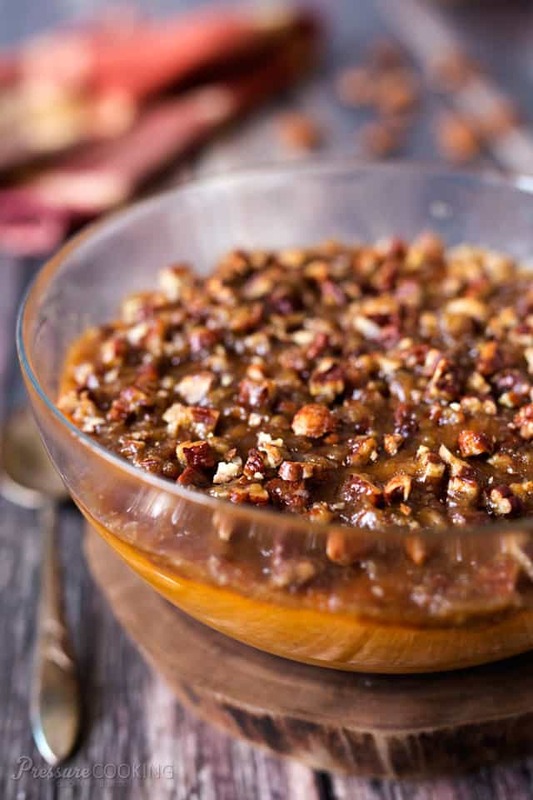 Then it’s topped with a brown sugar, pecan topping that gives it a little crunch. An Instant Pot is one of the most popular brands of electric pressure cookers. They are easy to use and your Instant Pot can help you create this delicious Sweet Potato Casserole! This year I decided to create a pressure cooker version of Paula’s recipe. My family loved the pressure cooker version just as much as the oven baked version. 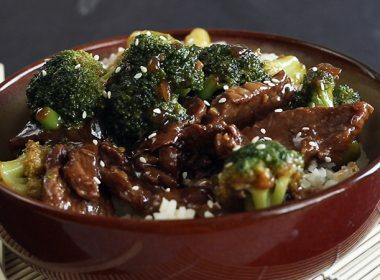 I popped the casserole under the broiler for a few minutes to caramelize the topping just a little bit, but that’s optional if you want to skip that step. If you’re like me and your oven is always too full on Thanksgiving, it’s nice to have an alternative way to cook the sweet potatoes. I hope you’ll add it to your Thanksgiving menu. 2 large sweet potatoes, about 2 lbs. Peel and cut sweet potatoes in half lengthwise and cut into 1/4-inch slices. Put a steamer basket in the pressure cooker pot. Add 1 cup water and the sliced potatoes. Lock lid in place, select High Pressure and 8 minutes cook time and start. When timer beeps, turn off pressure cooker and do a quick pressure release. When the pressure is released, carefully remove the lid. Place sweet potatoes in a mixing bowl and add brown sugar, butter, vanilla, cinnamon, and nutmeg and beat with an electric mixer until smooth. Add egg and cream, mix well. Mix together butter, brown sugar, flour and nuts with a fork; sprinkle over top of casserole. Put the trivet in the pressure cooker pot. Add 1 cup water and the casserole dish on the trivet*. Lock lid in place, and cook on high pressure for 15 minutes. 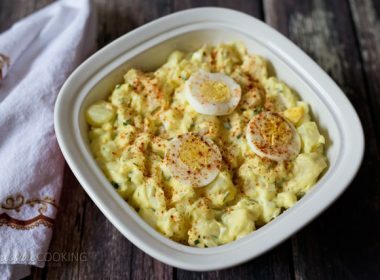 Is it possible to finish the casserole by baking/broiling it in the oven instead of using the sling and finishing it off in the pressure cooker? If so, what time and temp? Love your recipes! Thanks Darci! Yes, you definitely can. Bake it at 325 for 25 minutes. I am new to pressure cooking. I don’t understand the part about a sling. So you don’t put the casserole ingredients into the pressure cooker pot? Thank you. I will read about that. I’m excited to put my pressure cooker to use for the holidays. 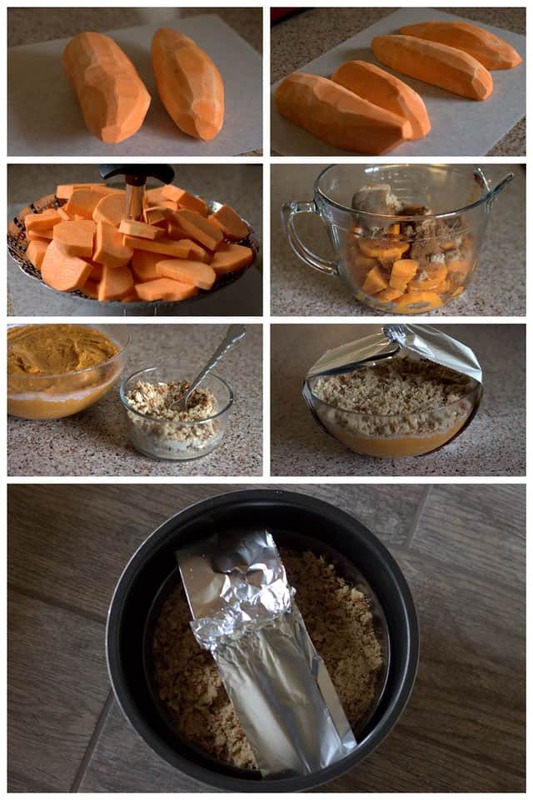 Did you cover your bowl with foil while cooking the sweet potato casserole! I’m making this for Thanksgiving! Thank you for the recipe ? Hi Mary – I didn’t cover it with foil. I’m making it for Thanksgiving again this year too. Hope you love it! Thank you for the recipe, I can’t wait to try it. I’ve noticed that you often don’t include servings/serving sizes. How many people do you think this would feed? 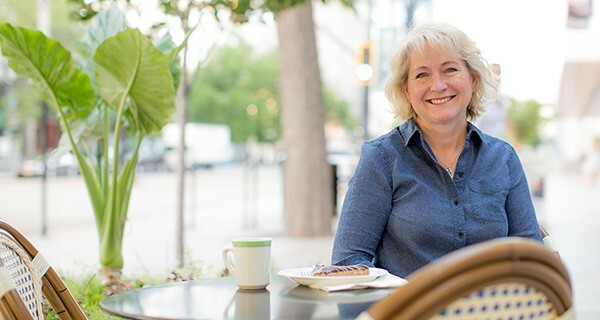 Hi Lisa – Most of my recipes feed my family of six. If you were serving this as the only side dish, then I’d say it would serve 6-8, but if it’s Thanksgiving and there’s lot of sides, then probably 12 servings. Sounds like a great recipe, but was wondering if you could delete the egg. My grandson is allergic to eggs and I like to make sure he can eat everything I make. Thanks! Barbara – thank you for this recipe, it looks delicious! !! I also want to thank you for this site and your many fabulous recipes (that I can’t wait to try). 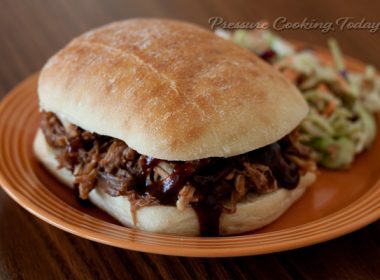 Thanks Lori-Anne – I’m so glad I could help you learn to love your pressure cooker. Have fun! Yams and sweet potatoes are two completely different things, so the terms are not interchangeable. We eat sweet potatoes. Yams – not likely at all. See the link below and show off your smarts! Try baking sweet potatoes, then just let each family member add butter, a little brown sugar and cinnamon, and they will love them all their lives! Wonderful nutrition! Or cut them into smallish cubes and roast them – they become naturally sweet! Or cut and fry them just like french fries – delicious! I have loved sweet potatoes all my life and am thrilled all that goodness is available year-round now, so we enjoy them once or twice a week. But never, ever, with marshmallows. Yuck. 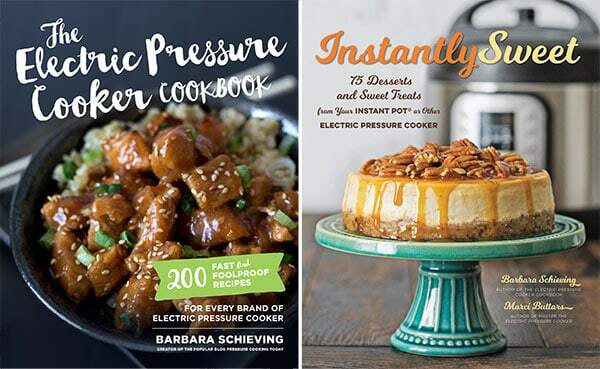 Thanks for these great pressure cooker recipes. Can this recipe be doubled? Hi Nette – No, I don’t think you’d be able to find a bowl that would fit in the pressure cooker that would hold double the ingredients. 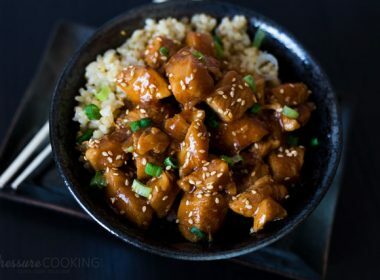 You could certainly steam double the sweet potatoes in the pressure cooker and finished it in the oven, or finish it in the pressure cooker in two batches. Thanks! We made this for Thanksgiving this year in my brand new Instant Pot. Quite honestly, it was my favorite dish on the table! It was just a little putsy to make but that probably could have been remedied by planning ahead with the prepping. Delicious! 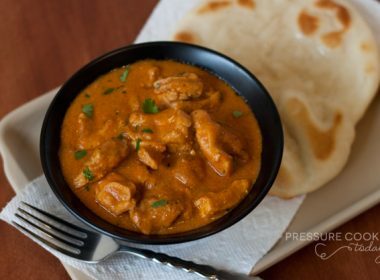 I have started a file in my Paprika app with all your pressure cooker recipes I want to try. I think next up might be the key lime pie! Yum. Thank you for all these recipes designed for the pressure cooker. Please keep them coming! I made the original and than I made a lighter version. The original to me was similar to pie. Very yummy. The second version – instead of brown sugar I used 1/2 cup of orange juice and instead of heavy cream used an equivalent amount of rice milk, instead of melted butter Used an equivalent amount of Extra Virgin Olive Oil.I kept the topping as written. Not as sweet yet it was tasty. Made the above casserole and it was excellent. I added more potatoes and did not add the nuts. A real keeper. I forgot to read through the comments about cooking it without the topping if you make this ahead of time and am making the whole thing early. Gonna pop it in the oven and broiler at dinner time and hope for the best! Contest entry? Hope I got it right. Good luck to everyone! I am new to pressure cooking, and I am hoping to use it This thanksgiving. Can I use any casserole type dish in my pressure cooker or are there special types of dishes for pressure cooking? Your recipes look so yummy! Thanks Ruth – any dish that fits and is oven safe should work. Enjoy! Thank you Barbara! I can’t wait to try these recipes! I love your recipes! I’ve used a stovetop pressure cooker for years and am new to an electric model which I love for so many reasons. Please keep your wonderful recipes coming. I haven’t been disappointed yet. Thanks Linda – that’s so nice! Yes indeed, that full oven with turkey and other goodies is always a dilemma when cooking Thanksgiving dinner for sure…i have 2 ovens, managed to fill both and still need room to cook one more thing off. Thank goodness for the pressure cooker-and you coming up with these great ideas! I’ve never had sweet potato casserole in any form-just sweet potatoes mashed with a little butter make me happy-my Mom and daughter too. This does look good…..almost like sweet potato pie without a crust. Thank You so much for this recipe! Our oven quit working recently and we only have the broiler working. If we can’t get it fixed by Thanksgiving I was wondering how I was going to fix my Sweet Potato Casserole which is almost identical to yours except it also has Rice Krispies in the topping. This recipe will be great. One question. Will a glass bowl shatter under the broiler? Thanks Debbie – rice krispies would add a nice crunch. Be sure and use an oven safe dish and don’t keep it under the broil for more than a few minutes. Thank you again Barbara. My Instant Pot will be getting a good workout. I plan to do 2 small turkey breasts in it then put them low in my oven on broil to crop the skin. A small ham will go into my old slow cooker and put into oven with the turkey. While all that is cooking in the oven then resting I will do this casserole and add the rice krispies before putting it into the oven with rolls to heat. That’s my plan if the oven doesn’t get fixed. I’m so glad I spent the extra money for the Instant Pot. It gets a lot of use. I’ve been making the Pioneer Woman’s version of this, and I absolutely love it. It’s really like a crust-less pie. Whatever it is, I love it. The pressure cooker conversion is brilliant, once again. This looks awesome! I have two questions though, how many would you say this recipe will serve? (i’m guessing 4-6) and could it be made ahead and re-heated before the meal? (We are driving 6 hours to our destination for Thanksgivng) I’d like to prep this and take in a cooler with us. Thanks for all your work and wonderful recipes to be made in our PC’s. Thanks Tamara! I would say it serves 6 – 8. I would probably cook the sweet potatoes and add everything except the egg. Then when it’s about 30 minutes before dinner, beat in the egg and top it with the pecan topping and cook it in the pressure cooker. I followed your link to Paula Deen’s original recipe, and she only has it in the oven for 25-30 minutes. 15 minutes of pressure cooking on High seems like a lot – basically, everything except the egg is already cooked, so I would think 5 – 7 minutes would be enough. A typo, maybe? Hi Annette – no it’s not a typo. When you’re cooking pot in pot like this the cook time is longer than when you’re just cooking in the pot.